Used as a hiding place in the smuggling era, the Cova de Can Marçà is situated between 10 and 40 metres above sea level inside a cliff of Port de San Miquel de Balansat, in the municipality of Sant Joan de Labritja. A visit to the cave shows the ancient geological forms and the waterfalls recovered artificially, and the view from different vantage points along the access of the spectacular panorama from Port de Sant Miquel, the Pas de s'Illa, the Murada island and the Molar tower. 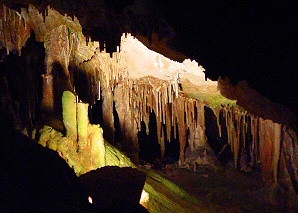 The cave can be visited all year.